read our team's thoughts on events, marketing, and communications in the lens of social impact - ideal content for nonprofits, social enterprises, and ethical brands. When I was in undergrad, I first read Half The Sky by Nicholas Kristof + Sheryl WuDunn, focusing on how we can turn oppression into opportunity for girls around the world. They touched on topics like maternal health, female genital mutilation (FGM), and human trafficking, and that was when I first realized that for girls around the world, access to a quality education changes everything. Since then, I've been a huge advocate for organizations and issues that empower women + girls around the world, specifically in developing countries. If I had been born into any other circumstance, that could easily have been me (or you), and it's important to remember all of the benefits that having a quality education can bring. If you scroll down, you can see just a few of them! And that's why I'm so excited to share about Kurandza and their newest campaign, #IStandForGirls. Kurandza is a nonprofit social enterprise that invests in the future of women in Mozambique, and their goal for September is to send 100 girls to school. With just $20/month for the year, you can send one girl to school and cover everything from tuition to transportation. And with additional donations, they're able to provide girls with after-school tutoring, empowerment workshops, health education, and extracurricular activities. I'm getting involved + sharing this for women like Percina, now Kurandza's Country Director who I had the pleasure of meeting in person. Percina was the first girl to graduate from high school in her village, after walking 10 miles to school each day. 10 miles!! Can you even begin to imagine?! Percina knows firsthand about the difficulty that girls in rural villages encounter when it comes to access to school, but she also sees the importance of her education. Investing in education for 100 girls impacts 10,000 people, and $20 a month can make that change. I highly encourage everyone to donate through September and invest in these girls with bright futures and even warmer hearts. Let's stand for girls around the world. 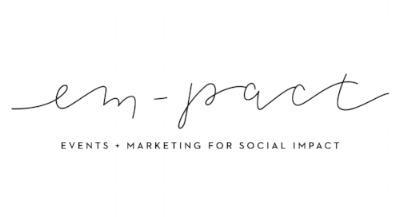 em-pact's mission is to empower socially conscious businesses to make an impact, through customized events, marketing, and communications services. Sign up with your email address to receive events + marketing content, news, and updates! We respect your privacy + will never release your information to third-parties without your consent.